A simple test involving a keyboard may allow quick detection of Parkinson’s disease, thereby helping patients slow down progression of the disease. Early detection of Parkinson’s disease is crucial in helping limit the deterioration of symptoms. Symptoms of Parkinson’s disease can worsen in intensity, and over a period of time, the person may find himself unable to perform routine activities without great difficulty. Diagnosis of Parkinson’s disease however, is a challenge. A lot of precious time may be lost between the appearance of the earliest symptoms of the disease, and an accurate diagnosis of the condition. The current standard for detection of the condition is the Unified Parkinson’s Disease Rating Scale Part 3 III. However, the test can only be administered by a trained specialist and at a diagnostic clinic. Research into Parkinson’s disease therefore, has focused on early detection of the condition. Digital technologies have proved vital to the development of detection techniques. Researchers have recently found that a simple keyboard method can be used to detect the earliest symptoms of the condition. 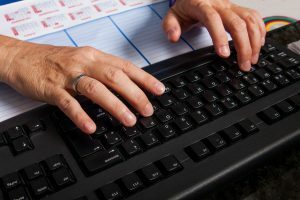 The keyboard technique involves analysis of the amount of time that a person takes after pressing the key to release it, while performing typing activities. The researchers believe that this is a fairly accurate method that can help detect the onset of symptoms. Motor signs of Parkinson’s disease may be detected quickly using the test. The test can be administered at a clinic, and using algorithms, specialists may be able to detect the earliest motor delays that are symptomatic of early stages of Parkinson’s disease. The keyboard test is also simple enough to administer in a remote setting, like home. The researchers administered the test to subjects, and found that with the analysis of typing patterns as part of the neuroQWERTY approach, they were able to accurately distinguish Parkinson’s disease patients from other subjects. In fact, the accuracy was comparable to the accuracy of the test results when performed at the clinic. The team of researchers now wants to develop the tool further to help track the progression of the disease over time. The Social Security Administration lists Parkinson’s disease in its Medical Listing book for approved disability impairments. In order to qualify for Social Security disability benefits, you may have to prove the existence of certain diagnostic criteria. These can include the presence of tremors, rigidity and balance or gait problems. Symptoms may be evaluated, and the agency will base its decision on whether the evidence provided is strong enough for a claim. To understand whether you qualify for disability benefits for Parkinson’s disease, call my office for a personal consult.